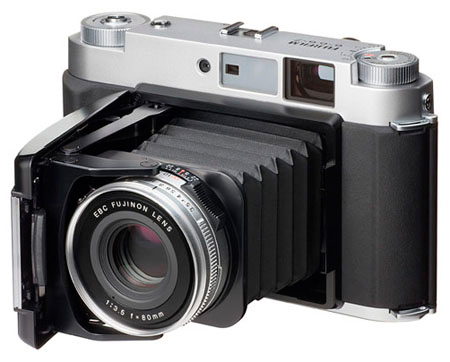 Fuji has announced that it is planning a wide angle medium format rangefinder camera called the Fujifilm GF670W. Fitted with a 55mm f/4.5 lens, instead of the 80mm f/3.5 of the GF670 (known as the Voigtlander Bessa III outside Japan), the new camera will shoot 6x6cm or 6x7cm images on either 120 or 220 roll film and will feature a coupled rangefinder, aperture priority and manual exposure modes and shutter speeds of between four seconds and 1/500sec, plus B(ulb). Unlike the previous model, the GF670W does not appear to be a folding bellows type camera, and a button/level on the front of the body seems to be holding the lens panel in place. This is pure speculation, but perhaps the camera will accept other lens panels in the future. The level appears to have a ‘lock’ position, but this could be a second shutter release. The company has not released details of pricing yet, and has not said when it expects the camera to become available for sale. The Voigtlander Bessa III currently retails for about £1650. 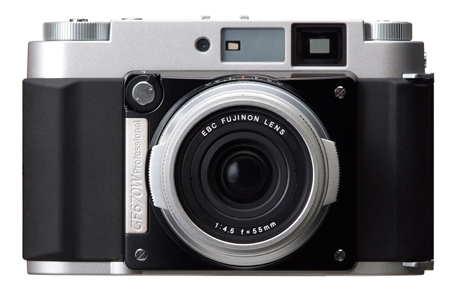 Dimensions and weight ‘Surprisingly light’ according to Fuji! The use purpose of this button/switch is not yet known, but it appears that it might release the lens panel from the camera or act as a secondary shutter release.